Kitchen remodeling is one of the most popular home renovation projects today – and for plenty of good reasons. For example, let’s say you purchased a house and want to customize the kitchen area to your personal wants and needs. Maybe you love the house you have been in for many years, yet feel it needs a bit of updating. Or, perhaps the number of family members living at home has increased or decreased in size and you want the kitchen to adjust accordingly. Do: Carefully think about everything involved in the process. Don’t: Get frustrated and give up. Consult with friends, neighbors and colleagues to get opinions. Create a planning workbook, featuring the styles and products you prefer. Sketch out ideas, and have a clear picture about how and what you want your new kitchen to look and feel like. Come up with a floor plan that will work well with the use of the space. Remember, the clearer the picture you have in your mind, the easier it will be when discussing the project with your contractor. Keep in mind: a kitchen remodeling project is going to be a test in the art of patience. Remodeling is not something that can be completed in a day or two. Don’t rush through the planning and designing phase. And try to keep the big picture in mind during the day-to-day minor “annoyances” of the construction phase. Do: Use what you have. Don’t: Attempt something you can not realistically pull off on your own. Removing or relocating a home’s structural elements (or gas lines) may be costly. Use footprints of your original space to create something better and more useful. Yet, when it comes to handling gas lines, installing structural components and more, it’s smart to hire an experienced contractor to do the job. Don’t: Overdo it (a common remodeling issue). An overly designed kitchen can lead to sensory overload. And knowing when you need to stop can be a real challenge. Remember, in many cases, less is more. A well-designed kitchen has the right amount of function, decor and flair. Keep it simple, yet complementary to the rest of your home. Do: Hire a trusted contractor to get your work done. Remodeling a kitchen is much different than remodeling a bedroom or family room. Bring in specialized, experienced professionals to remodel your kitchen, according to your style. There are plenty of other dos and don’ts for any type of remodeling project. 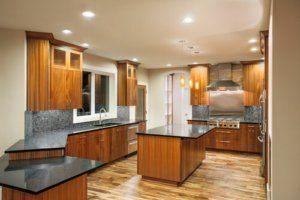 The team members at Republic West Remodeling have the skill, knowledge and hands-on experience to help you learn more about what you can do to make your Scottsdale kitchen remodeling project a dream come true.